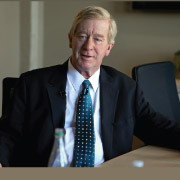 William 'Bill' Weld was elected Governor of Massachusetts in 1990 with 51% of the vote. More importantly, he was re-elected in 1994 with a record breaking 71% of the vote, a record that still stands today. Despite the state legislature being controlled by a Democratic majority, Bill managed to cut taxes 21 times and did not permit any tax increases. A 1994 report from the Cato institute concluded that, "Weld cut spending, balanced the budget, improved the state's bond rating, and cut numerous taxes. Even with a Democratic legislature, Weld has a stunningly successful fiscal record." How did he do this without compromising education and other important state functions? That's simple, too: He doesn't believe that a government that looks to your pocket book to solve every problem is a healthy way to conduct policy. Rather, Governor Weld identified areas of government inefficiency, spending that was not serving the public interest, and got rid of wasteful programs that would never be supported if the people knew just how unproductive they were. That's why, in 1992, he was rated the most fiscally conservative governor in the United States by the Wall Street Journal. And more importantly, the unemployment rate in Massachusetts plummeted from the highest among the eleven industrialized states to the lowest by the end of his first term! But don't think that Bill's pursuit of fiscal responsibility prevented him from his personal belief in social tolerance. Bill was not only an early proponent of civil rights for gays and lesbians, he actually appointed the judge who wrote the opinion that established marriage equality as a matter of constitutional right. He was also an outspoken defender of a woman's right to choose, rather than allow government to make such an important personal decision for them. "Before my tenure, people didn't seem to think that citizens had a right to limit the size of their government." Bill and his wife Leslie Marshall make their home in Massachusetts and have eight children. Along with Governor Gary Johnson, he is the most experienced former executive running the race for the next President of the United States of America.